On the Recapture Self podcast it’s our intention to give you a peek at the lives of people who are balancing daily life, parenthood, and a commitment to their creative selves. These are people who are making time and space for their passion projects whether that be writing a book, designing a blog, photographing their family, or running a business. PREPARE TO BE INSPIRED BY THEIR STORIES. This week I’m chatting with Tiffiney Lozano. Tiffiney Lozano is a writer, mama, diehard mountain girl, lover of adventure, and a believer in possibilities. In her former life, she a marketing and public relations professional for a string of great organizations including Whole Foods Market, the PlumpJack Group, and the California Community College system. 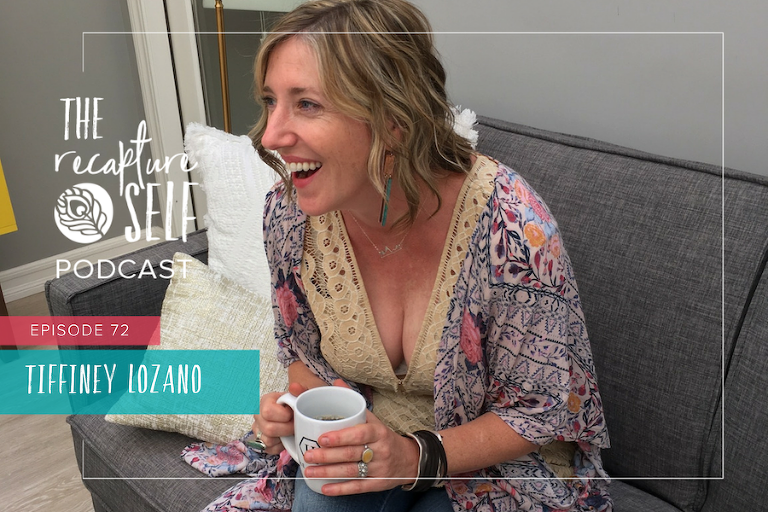 Now a creative entrepreneur, she runs a boutique video production business with her husband in Northern California and offers playful workshops for women seeking to reconnect with themselves, their creativity and the world around them. She shares her journey to live more from her heART, and less from her head, in hopes it gives others permission to do the same. She hosts a free community called the heART and Soul Cafe, which offers fun creative invitations for your daily practice, and celebrates the idea that we are both the artist and the masterpiece of our lives. You can find her online at www.wildchildtravels.com or www.tiffineylozano.com. The Mosaics of Our Lives Writing Journey is a free mini-course that delivers a week of inspiration and journaling prompts right to your inbox for 7 days. We’ll also be introducing you to some of my favorite creative entrepreneurs and get a sneak peek into their creative practices.